Robert Broom (Nov. 30, 1866 – April 6, 1951) was a South African doctor and paleontologist. From 1903 to 1910 he was professor of zoology and geology at Victoria College, Stellenbosch, South Africa, and subsequently he became keeper of vertebrate paleontology at the South African Museum, Cape Town. Broom was first known for his study of mammal-like reptiles. After Raymond Dart's discovery of the Taung Child, an infant australopithecine, Broom's interest in paleoanthropology was heightened. In 1934 he jojned the staff of the Transvaal Museum in Pretoria as an Assistant in Palaeontology. 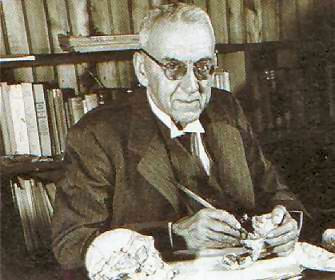 In the following years, he made a series of spectacular finds, including fragments from six hominids in Sterkfontein, which he named Plesianthropus transvaalensis. In 1937, Broom made his most famous discovery of Paranthropus robustus. These discoveries helped support Dart's claims for the Taung species.